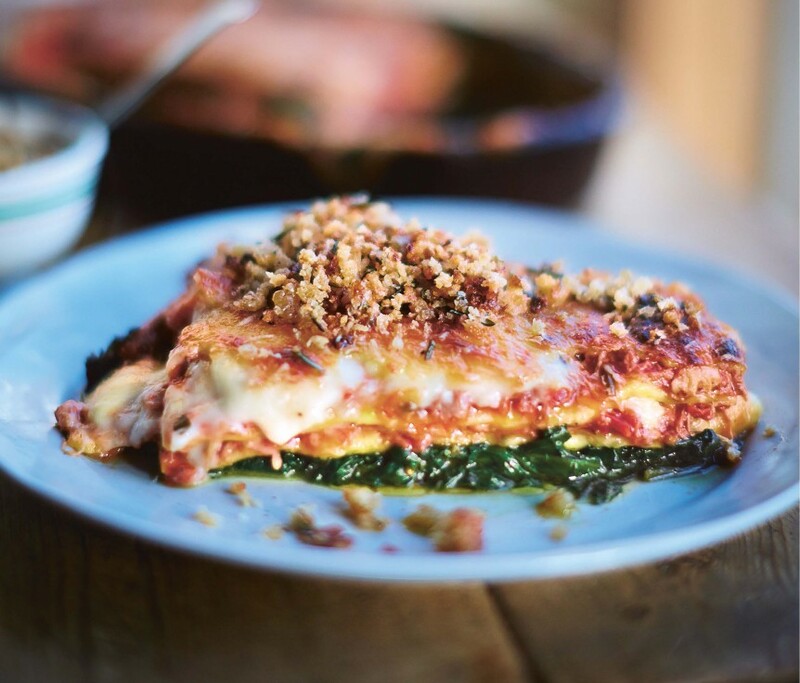 Everyone loves a good lasagne, but I have to say this one really is very special. The stages of making the pasta and roasting the duck, then pulling all the meat off for the wonderful ragù sauce, are fun, simple and a real labour of love. This dish is going to create memories. Preheat the oven to 180°C/350°F/gas 4. In a tray, rub the duck all over with oil, sea salt and black pepper, then roast for 2 hours, or until golden and crisp, draining off the fat into a jar. Leave to cool, remove all the skin and fat from the duck and place in a food processor, then strip all the meat off the bone into a bowl. Peel and finely slice 2 cloves of garlic, then put into a large non-stick pan on a high heat with a little duck fat and the marjoram leaves. Cook until the garlic is lightly golden, then stir in the spinach and a good grating of nutmeg and cook for 15 minutes, or until the spinach has cooked right down and all the excess water has evaporated. Leave to cool while you make your ragù. Peel the onion and carrots, trim the celery, then roughly chop it all. Place all in a large pan on a medium heat with a little duck fat (keep any leftover fat in the fridge for making great roast potatoes) and crush in the remaining garlic. Fry for around 20 minutes, or until the veg are starting to caramelise, stirring regularly. Pour in the Chianti, turn up the heat and cook it away. Add the shredded duck meat and tinned tomatoes, along with 1 tin’s worth of water, the bay leaves and cloves. Give it a good stir, simmer for around 1 hour, then season to perfection. Meanwhile, make your pasta dough. Next make your white sauce. Melt the butter in a large pan over a medium heat, then stir in the flour to form a paste. Whisk in the milk, a little at a time, and continue to heat until you have a thick white sauce. Remove from the heat, grate and stir in the cheeses, season to taste and add a grating of nutmeg. To build your lasagne, start by rolling out the pasta dough into sheets. Cover the base of a baking dish (25cm x 30cm and 8cm deep) with a good layer of spinach, then cover with a single layer of pasta sheets. Stir a good grating of Parmesan into the ragù, then cover the pasta sheets with a layer of ragù, a thin layer of spinach, a layer of white sauce and another layer of pasta. Repeat twice more, finishing with a layer of white sauce. Top with a good grating of Parmesan, then bake at 180°C/350°F/gas 4 for 40 minutes, or until golden and bubbling. Leave to rest for around 20 minutes before serving.